Defender MZ - Kenya Biologics Ltd.
DEFENDER MZ is a complex of micronutrient organic molecules from algae extract (TCA basically, amino acids, vitamins and natural plant hormones). DEFENDER MZ helps to overcome deficiency states and weakness associated with a lack of manganese and zinc, which is a result of floor fatigue or a basic pH. Application of DEFENDER MZ improves soil structure, cation exchange capacity, the release of locked elements and their assimilation by the roots. It is used to prevent the emergence and development of physiological disorders caused by manganese and zinc deficiencies in all crops. Manganese deficiency occurs in middle-aged and young leaves as chlorosis spots between veins and ribs of a leaf. This is attributed to the formation of disruptions in chloroplasts. In case of grass plants, chlorotic and necrotic streaks are formed. Deficiency symptoms are especially characteristic in oats, referring to the gray spot disease. You can see streaks or dull gray points in the basal part of the leaf. The manganese deficient plants have a small cell volume, which disrupts the cell extension growth and lateral root formation (secondary). On the other hand, a deficiency of zinc results in small and pink colored leaves with often white tips, causing dwarfism or growth retardation while also inhibiting the growth of branches and causing death of young shoots in fruit plants. Furthermore, it causes the loss of premature leaves. In vineyards or grapevines, one can observe an increase in the number of tillers while grapes stay small and middle-aged and old leaves generate chlorotic spots with dead areas. It affects primary outbreaks and does not allow root development. The mode of action of DEFENDER MZ is the sum of the preventive and curative effects of the microelements present in the formulation and the great biostimulant power of the seaweed extract. Together, DEFENDER MZ has special applications and allows to quickly correct nutritional deficiencies and stimulate the recovery of plants. 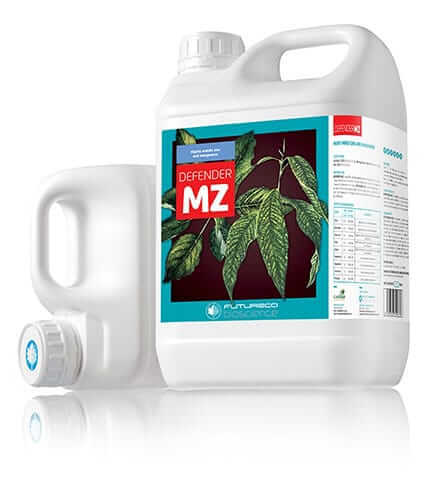 DEFENDER MZ can be applied through regular drip irrigation or by foliar spray, the best way to overcome punctual deficiencies or prevent losses of plant and fruits growth. DEFENDER MZ is stable for at least four years since manufacturing date. Store in the closed original container in a cool and ventilated area. DO NOT store for prolonged periods in direct sunlight. Keep away from food, drink and animal feed. Keep out of the reach of children. Use in case of recognized need. DEFENDER MZ is compatible with most pesticides, however it is recommended to test physical compatibility before mixing. Bio-stimulant compounds present in the formulation are 2g/L of alginic acid, 0.5g/L of amino acids, 1g/L of proteins, 100ppm of calcium (Ca), 100ppm of magnesium (Mg), 20ppm of natural phytohormones and 20ppm of vitamins. *Composed of cytokinins, gibberellins and auxins. Apply at the start of sprouting and repeat as necessary depending on the degree of deficiency. Apply at any moment during vegetative growth. Do not exceed the recommended dose indicated in the label and restrict its use to cases of recognized need.